If you are looking for fragrance in an evergreen tree then Magnolia alba (syn Michelia alba) is well worth considering. Also known as ‘Paklan’ (meaning ‘white orchid’, the flowers appear from summer to autumn. The buds form pointed and white and open to a spidery creamy coloured flower. The flowers may not be as large as some other magnolias, however the fragrance is strong and so well regarded that it is used as a base in perfumes and cosmetics. Magnolia alba is an evergreen tree and is easy to prune. These two characteristics give it even more value in landscaping. It can be used as a screening plant and can be pruned as a hedging plant. The best use of Magnolia alba is in a position where the fragrance can be appreciated. Close to outdoor entertaining areas, or near pathways and entrances is ideal. In Asia the flowers are used in garlands and often picked and floated in water bowls in homes and temples. This is a species that requires a frost free position. It is an evergreen species from south East Asia, so naturally grows in tropical to sub tropical climates. In cooler areas it requires a warm protected position to thrive. New plants should be staked to help form a strong upright habit. soil should be amended before planting with the addition of well rotted compost and aged cow or sheep manure some weeks before planting. Plants should be watered in with a liquid seaweed fertiliser and mulched. Young plants should be protected through the first few winters in colder climates. Height – To around 8m, sometimes taller, however often pruned to 4m. Spread – Expect a grown of 3 – 4 m in a mature tree. Soil – Humus rich, moist well drained. Look for a pH of 6, although Magnolia alba is not that fussy. Position – Full sun to some afternoon shade. Magnolia alba will struggle in deep shade. Flowers – White to creamy white, small and fragrant and spidery. 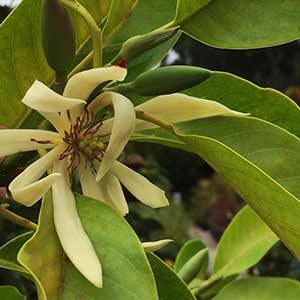 Magnolia alba is available for sale from the following participating wholesale nurseries.